Specially designed and formulated hydrophobic environment, providing better comfort and less trauma to a patient during any dressing change. Our dressings accommodate clinician options in treating a wide range of wound types and sizes. Our foam dressings are made out of high quality reticulated polyurethane/polyethylene foam with an open pore structure (400-600 microns). The use of our hydrophobic, hydrophilic and silver foam dressings were designed with flexible contours for deep or irregularly shaped wounds. UNI foam dressing kits promote cellular activity and formation of granulation tissues in wounds. 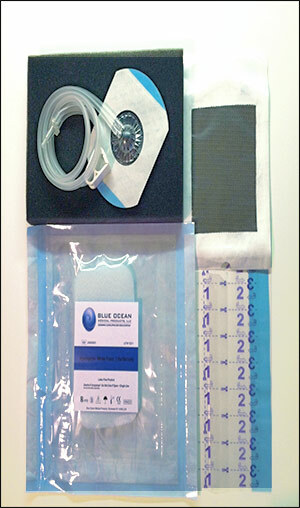 The UNI foam dressings helps draw wound edges together, remove wound fluids and infectious materials. Our foam technology works actively and can easily adapt to any NPWT pump systems. Accelerate wound healing and helps eliminate infection. Click here to learn how To Bridge A NPWT Foam Dressing On Two Wounds? Click here to see how connector works.